1. Barrett’s paper blends together two distinct questions: (a) What makes sense to do about global warming, and (b) What countries will in fact do about global warming. 2. On the traditional “realist” view of international politics, this blending makes sense. According to this theory, countries act in their objective self-interest, so slippage between optimal policy and actual policy can only be caused by differences in national self-interest and transactions costs. 3. From my point of view, however, optimal and actual policy often diverge even for purely domestic questions. Since people have biased beliefs about the effects of policy, highly inefficient policies can and do win by popular demand. If domestic politics are this defective, why should we expect international politics to be any better? 4. What does this have to do with global warming specifically? Well, Barrett explains that geoengineering might turn out to be an extremely cost-effective solution to global warming. He then goes on to discuss the political barriers to its adoption. But he seems to ignore the most obvious barrier of all: Many – perhaps most – people would dogmatically oppose the geoengineering solution no matter how strong the evidence in its favor. 5. But won’t people also fervently resist extremely costly solutions for global warming? It depends. If the cost is visible and noticeably reduces living standards, then popular opposition might well be intense. But smart politicians can get around this problem by obscuring the cost (imposing emissions regulations rather than carbon taxes, for example), and making sure that the costs come in the form of lower growth rather than absolute declines in living standards. 6. Bottom line: All things considered, geoengineering looks far superior to other policy options on the table. But despite its advantages, it probably won’t be adopted, because public opinion in the world’s leading democracies won’t stand for it. And even dictatorships usually try to avoid big clashes with public opinion (not to mention the leading democracies), so China probably won’t save us either. Part of the problem, and perhaps you appreciate it, is that free-market think-tanks like the AEI have poisoned the waters for so long that it’s hard for those of us in the scientific community to treat anything related to climate that comes from those sources as being done in good faith. If geoengineering is to become respectable its advocates will have to act respectable, meaning that they will have to start publishing in the geophysics or climatology literature and presenting at those conferences, so that their ideas get immediate attention and analysis by their most capable critics. Sulfate aerosols are out due to the effect on the ozone layer, and any scheme that doesn’t address ocean acidification is no go. The hubris required to think we know enough to “engineer” the planet is unimaginable. A libertarian that advocates this, has to completely ignore the law of unintended consequences and do so very much at their peril. man always think they are or will be right . Only the god know the future . A tax or a cap on carbon emissions is at least rational, even though I do not necessarily think it is a good policy. Geoengineering is like opening Pandora’s Box – once done, there is no turning back. Given the climate’s extremely long cycles, the intricacies of planetary systems (currents, wind and rain patterns, etc. ), and the relatively short length of time humans have studied climate, it is completely irrational to try to “engineer” the the climate to reduce a slight rate of warming. Especially when both the warming rate and the overall temperature are not unprecedented or even unusual in the climate’s history. Geoengineering isn’t necessarily a Pandora’s box; there are geoengineering solutions that can be turned on or off at will. (I agree that hard-to-undo solutions, like putting stuff into orbit, is a bad idea). But I think Bryan is right– geoengineering will be dogmatically resisted by people no matter the evidence, because of the “Appeal to Nature” logical fallacy. Toward the end of the video someone asked how other cultures might view geoengineering. I lived in China for most of 2007 and my impression is that some type of geoengineering would not only be politically possible, but is in fact more likely than a meaningful limit on carbon output. Even if it were just a massive tree planting program or more aggressive cloud seeding. I have never met a Chinese environmentalist. My sense is that most Chinese view nature and domestic animals as goods that exists to serve humans. I wonder if the story is similar in other quickly developing countries. Environmentalism seems to be a religion mostly confined to places that have already become rich. But despite its advantages, [geoengineering] probably won’t be adopted, because public opinion in the world’s leading democracies won’t stand for it. And even dictatorships usually try to avoid big clashes with public opinion (not to mention the leading democracies), so China probably won’t save us either. True, but except for very few basic issues, voters do not insist. If major political parties reach consensus opposite of the popular opinion, very few voters will punish them and start voting for marginal parties. Saying that, I do not know enough about geoengineering to be pro or contra. You should know by now that a distinction between those who value “nature” for its own sake and those who don’t is not what separates environmentalists from everyone else. The caricature of the environmentalist as the tree hugger is outdated by decades. Perhaps the Chinese, like much of the American public, are ill-educated to the point where they don’t make the connection between environmental damage and harm to humans. To learn why we care about this, have a look at the Working Group II section of the IPCC report (and not the silly Summary for Policymakers). It’s a light read. I agree with your thoughts regarding the likelihood that countries will talk big, but do very little that is not in their direct, and near-term interest. On this particular topic though, it is a moot point. The only rational response is do nothing. None of the present proposals do anything significant for the climate and have outrageous costs. Bjorn Lombard and others have covered that ground extensively. Oh btw……you might want to check a thermometer…..warming stopped back in ’98 and over the last hundred years shows no consistent correlation with GHG concentrations. I’d love to see geo-engineering experiments done on Mars, in which we can make predictions, run the experiment, and see what happens. Controlling for external variables will be hard, but a helluva lot easier than on Earth. I have no illusions about getting my wish. I count one factual error and one fallacious mention of an irrelevancy. 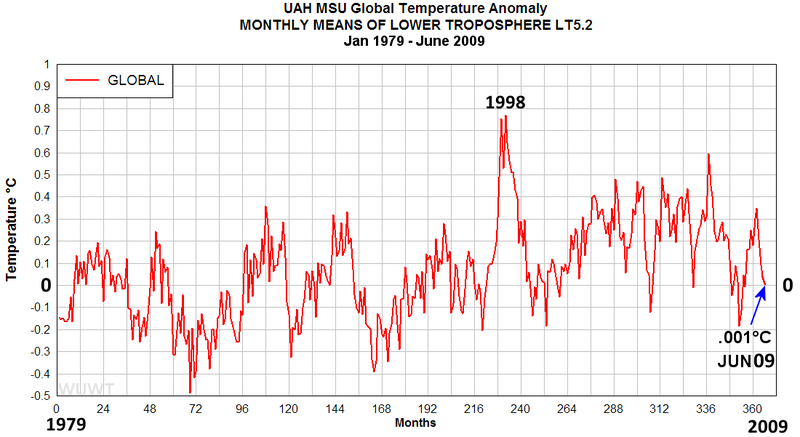 To get the factual error corrected start at http://www.skepticalscience.com/global-warming-stopped-in-1998.htm . For the irrelevancy, read the IPCC report and references therein to learn why nobody cares about correleations with GHG concentrations. We’re not so naive to simply be calculating correleations here; we know some of the unerlying physics. I’d love to see a post from Bryan Caplan applying his thoughts on rational irrationality to people like this ws1835 character, who seem to repeat anti-AGW arguments without any regard to their merit. The “Warming has stopped” thing has been debunked so many times that merit cannot explain its popularity.